Today was another thrilling day, more of a theatrical thrilling day. Since I had to go to an all-day training class today, this gave Nancy, the kids, and her college friends, Ommar and Rachelle, a chance to have a mini-reunion. First, during the afternoon, Nancy’s college friend, Ommar, bought them tickets to Rocky on Broadway(a matinee show at 2pm) playing at the Winter Garden Theatre. Yes, Rocky, based on Sylvester Stallone’s movie. Yes, Rocky, as in Rocky Balboa….as in “Adriaaaaannnnnn!!! And no, Stallone was not in the show. Although the show has been playing on Broadway for quite a while now, I never really had the interest to try and catch the show. In my mind, “C’mon, a boxing musical?” I mean, what’s next? Divergent, or Transformers, The Musical? Well, I was proven wrong. My family has encouraged me to watch it in the future. 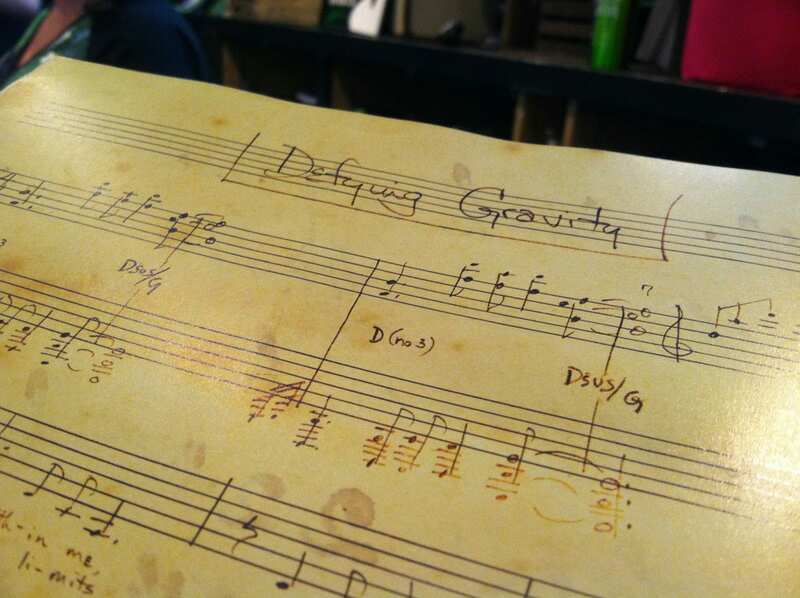 According to them, the set-up of the theatre was different, (there’s a regulation-size boxing ring that puts the audience close to the ring) and the music and storyline was also good. 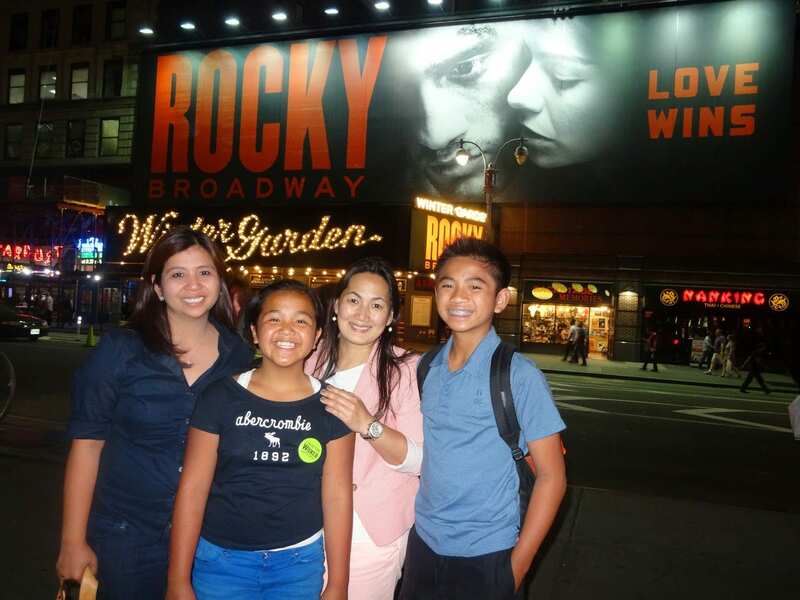 For more, go here Rocky Stage Magic (Playbill article) I don’t even remember the actual movie anymore, but for my family to enjoy the show, that’s good enough for me. Maybe I’ll go see it in the future. However after a year of being on Broadway, the show will close this month, so maybe I’ll catch it when it tours in LA. BTW, since this was a matinee show, it finished before 5:00 pm. And because this took place on a Wednesday, most of the shows on Wednesday have a matinee and evening shows. time to breathe by the time we entered the theatre. We were soooo lucky. Thank you, Madz!!! Front row…center orchestra, directly behind the conductor. BTW, these front row tickets were just $30 each…SCORE! You can’t get any closer than that (unless you’re one of the cast members) LOL!!!! This must’ve been my 5th or 6th time watching Wicked (and most of them were winning via lottery tickets). I can still remember the first time we watched Wicked on Broadway, it was June 2004 (exactly 10 years ago….Father’s Day). Nancy and I were vacationing in NY. We joined the Wicked lottery. Wicked was just playing in NY for about 8-10 months around that time. Again, by pure luck, Nancy’s name was picked! What a great Father’s Day treat for both of us. The only time I didn’t do the lottery was when Wicked first stopped in Los Angeles. Although I’ve seen it quite a few times, the energy of the show, the music, and the effects still amazes me. I am just so glad, although 4 of us didn’t get to watch this together in NY, however, 4 of us watched this show by winning the lottery. Wicked-mission accomplished. The show ended around 9pm. 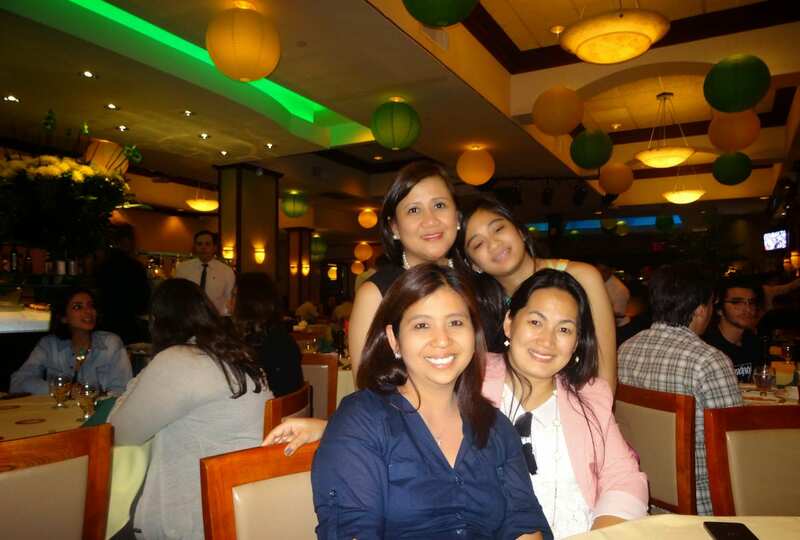 While Ethan and I watched Wicked, Nancy was with her college friends Ommar, and Rachelle. They all hung out in a local Brazilian restaurant, got all caught up with their college lives, and their lives nowadays. After the show, we all met up outside the Gershwin. Rachelle had already left the restaurant. By then it was time to say thank you and goodbye to her friend, Ommar, who lives in Staten Island. She was parked close to 6th Ave – not too far from the Winter Garden Theatre. 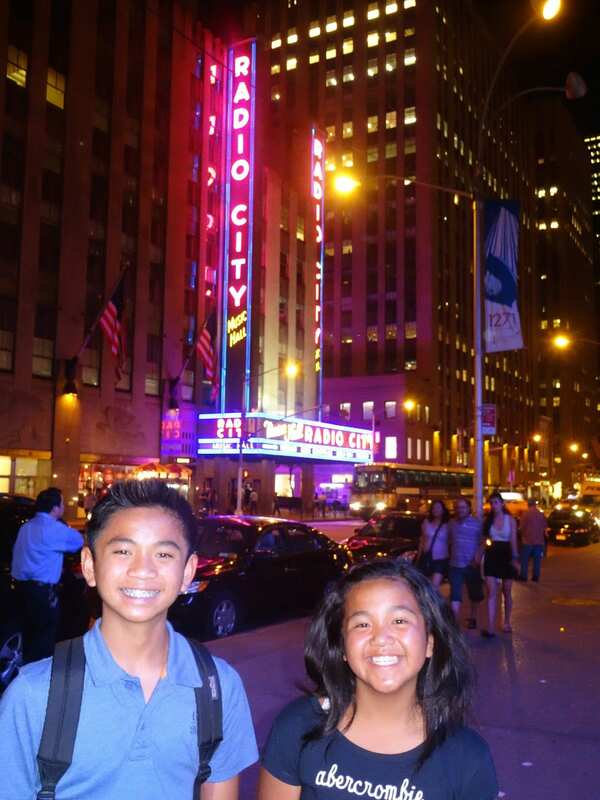 While we were in the area, we also got to take pictures around the Rockefeller Center and Radio City Music Hall. 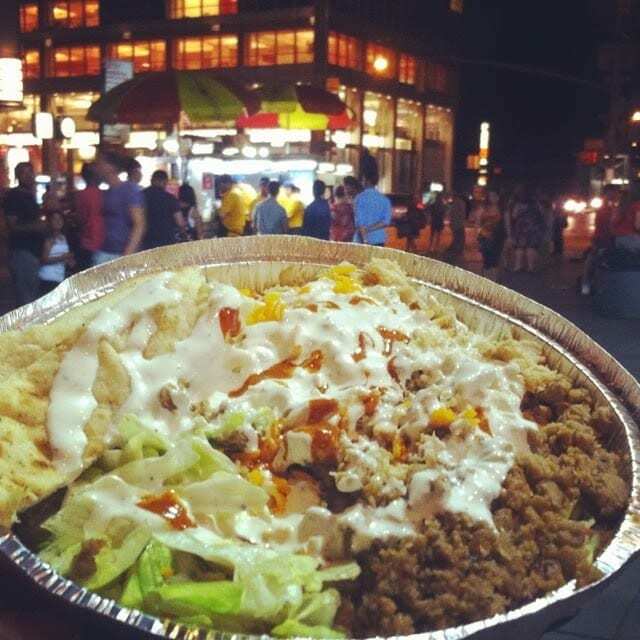 We’ve built an appetite around this time, and all we could think of was to eat chicken over rice from The Halal Guys. It was only a few blocks away near the Hilton Times Square. As expected there were long lines, but the lines moved so quickly that we got our food in no time. You can’t beat the deal. For $6, you get chicken or gyro or both with rice, pita, salad plus your choice of sauce (yogurt sauce and hot sauce). The portions were large enough to share. We ordered 2 plates and all 4 of us had more than our fill of Halal food…..sooooo good!!! That’s it….Day Five in the city…..tomorrow….more theatre and of course good eats. Amazing good fortune and timing. All I can say..hooray! HI Janette! I still couldn't believe the luck we were having. It was such a thrill to have our names picked during the lotteries….we were amongst a crowd of 100-300 and they only gave out roughly 20 tickets for the show.